Read moreAvoid low fat diets! The truth about fruit – should you eat it? Read moreThe truth about fruit – should you eat it? 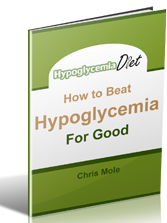 When I first discovered the glycemic index a few years ago I thought I had finally found the missing piece of the hypoglycemia jigsaw. I knew from experience it wasn’t just as simple as cutting out sugar. For example, on many occasions I had eaten what was supposedly a “healthy” lunch with no sugar, only to get hypgolycemic symptoms during the afternoon.